In 2012 the Power Metal band HELSTAR celebrated its 30th anniversary with the live release “30 Years Of Hel” (see my review here), consisting of 20 songs covering most of their back catalogue. A required purchase for any HELSTAR fan out there, of course. This live release came out two years after the band’s last studio album, “Glory Of Chaos”, which was a fiercer and faster album compared to “The King Of Hell” (2008). Lots of gigging and working hard resulted in a new studio album, showing that HELSTAR is still a massive force to reckon with, even or especially after 30 years. “This Wicked Nest”, released on the 25th of April 2014, clearly shows the band was satisfied with the Thrashier songs on “Glory Of Chaos” and decided to continue that direction, while – it is said – also bringing back old school influences. On bass, no Jerry Abarca this time. Did he leave the band? I admit I haven’t followed HELSTAR close enough to know about this. In any case, the bass parts on “This Wicked Nest” were handled by Matej Sušnik from the Slovenian Heavy Metal band METALSTEEL, who recently put out a new album as well (“This Is Your Revelation”). “This Wicked Nest” kicks off with the building intro (melodic, hymnic) of “Fall Of Dominion”. Drums are added for tension. The conventional Heavy Metal approach is nice, yet so un-HELSTAR to me. James giving a little speech and then the battle commences! Fast, sharp riffing and thunderous drumming are the key ingredients in this destructive track. It’s dark, relentless and devastating Power/Thrash Metal. And oh so tasty! The fire still burns inside James’s throat. Just listen to those screams and vicious vocals. Melody mainly comes out in the chorus, thanks to the layered clean singing, while “Fall Of Dominion” is screamed out. Talk about contrast. Over halfway the band enters a dark alley, gallopping through it. Solos follow soon enough, even in dual form, before it’s back to business. This one track alone already shows there is still fire (not a candle, but a bonfire) in the band. Excellent stuff! “Eternal Black” indeed sounds quite dark and powerful to begin with. As if an introduction to hell, while the drums roll on. And then the gates are open: the Metal pounds onwards, with a light progressive touch in the drumming (a detail, but still…). Another very qualitative Power/Thrash song. This time the singing is lower, yet still rough and this fits perfectly here. It’s a linear song, but the riffing changes halfway in favour of a Thrashy approach. James must follows and screams from the top of his lungs. Again the solo follows at this point after which the band continues the rest of the song. “This Wicked Nest” kicks off directly, rolling forward in a threatening manner. Ferocious screams are added to make it all sound more evil. Full, thundering power is activated then, now with cleaner singing. Like before, there’s a bridge (vile and evil in this case) before the solo. Another super highlight, in my opinion, is “Souls Cry”, which sets in the second “This Wicked Nest” is left behind. On offer is catchy, galloping Power Metal with clean vocals. In the bridge the singing becomes more hymnic, I’d say. This then leads to the short, straight-forward chorus, which in turn is later followed by a rather short solo moment. Afterwards it’s back to business. Overall, I’d say the song is, in terms of rhythm, more varied than before. The sound of playing children in “Isla De Las Munecas” (more info e.g. here) contrasts so heavily with the evil and tension filled music that comes into play. It’s another varied song on all levels. And far from a happy one. It’s also fully instrumental, but I guess vocals aren’t really needed here (yet they would fit), as the story behind the island is also creepy enough. “Cursed” starts slowly, reminiscent somehow of e.g. BLACK SABBATH. Clean verses, clean singing… it’s almost a ballad. The music grows slowly in power as the chorus draws near, at which point James’s vile vocals come into action. However, the chorus remains slow, yet hymnic and Doomy. Halfway there’s a METALLICA touch in the music, reminiscent of the self-titled best-seller from 1991. Or METALLICA meets PANTERA. See also “Cemetery Gates”. I do have to get used to James’s very clean singing here. Next in line is another great highlight: “It Has Risen”. This one begins with evil-sounding music, breaking loose into very catchy Thrashy Power Metal. Fan-tas-tic! The music thunders and pounds in the chorus, while the solo was this time sandwiched between two dark, screamy parts. The quality remains high, as confirmed in “Defy The Swarm”. Its fast riffing indicates it could have been a SLAYER song, as the Thrash input is big. Once unleashed, there’s no stopping this violent, relentless and devastating force! The guitar work takes on different form and a sharper sound in the part before the solo. Last but not least, definitely not, the band decided to end with a bang, despite the album being full of those: “Magormissabib”. I had to look it up: ” fear on every side, (Jer. 20:3), a symbolical name given to the priest Pashur, expressive of the fate announced by the prophet as about to come upon him. Pashur was to be carried to Babylon, and there die.” (copied from dictionary.com, but there are of course other sources as well) This song has power, it has speed, and it sounds aggressive, very much so. Again contrast was created between the verses (with clean singing and straight-forward music) and the chorus (screams and pounding Metal). The second part is introduced by the drums, rolling onwards with James’s hymnic vocals until it’s solo time. Afterwards it’s back to the power of before. Military drumming puts an end to the Metal, to be replaced by an atmospheric piece with chanting. As this comes to a close, you’re left with another minute of silence to let it all sink in, because “This Wicked Nest” is one lean, mean, aural killing machine. 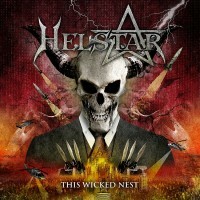 It is clear that HELSTAR have created one hell of an album with “This Wicked Nest”. “Glory Of Chaos” was already quite different from “The King Of Hell”, but now the band have taken it to the next level. Accomplishing this even after 30 years deserves massive kudos and hats off for the effort. One little remark on the mix, though: I find the snare a little too loud, an issue that’s apparent on lots of contemporary releases, sadly enough. But despite this (small) issue…. it’s safe to say that “This Wicked Nest” is without the smallest doubt one of the best albums of 2014, if not of the last 5 years.